The teatro dei Rassicurati in Montecarlo, Lucca is the chosen venue for a youthful production of Mozart’s Don Giovanni on 22 & 23 June, performed under the expert baton of conductor, Jonathan Brandini. This will be the second of the trilogy of Mozart/Da Ponte operas, the first being The Marriage of Figaro, performed in June, and the last, Cosi Fan Tutte, which will be performed in August. The exterior of the tiny Montecarlo theatre is almost indistinguishable from the other buildings in the row, and very different from the grand Puccini open - air theatre set in Torre del Lago, but after undergoing various restorations, the interior provides the perfect setting for Mozart. 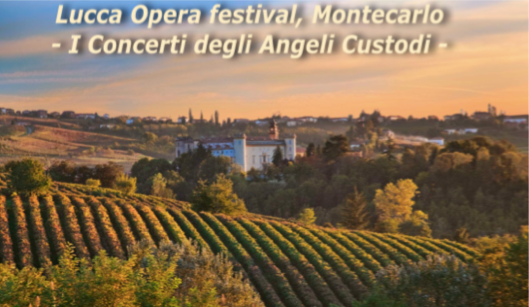 These opera performances are being organized by the cultural association LuccaOPERAfestival, an exciting venture founded in January 2013 with the aim of promoting and popularizing musical culture in and around Lucca. Mattia is also the artistic director of I Concerti degli Angeli Custodi which he founded in May, 2012 and which produces a wonderful selection of vocal, sacred, chamber and contemporary music. 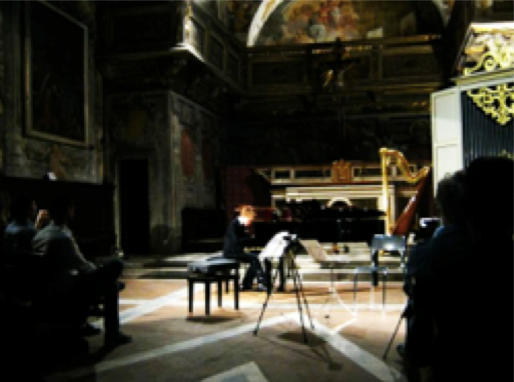 The concerts are so called because they are performed in the Oratorio degli Angeli Custodi, another small venue, but this time in Lucca itself. The president and artistic director is the young baritone, Mattia Campetti, a local boy who was born in Lucca and studied at the university of Pisa and the School of Opera and theatre in Bologna. The association’s far-reaching enterprise is already gathering momentum, and its aims include the provision of education training opportunities, a welcome and necessary addition, especially for young people. The summer season of concerts and other events being now in full swing here in Tuscany, we were not surprised when walking down Via Santa Croce in Lucca on Saturday, (after a day spent enjoying the sun and sea air) to hear the faint but very recognisable sounds of a Mozart opera being rehearsed nearby. Curious, we wondered down the narrow via dell’ Angelo Custodi and stood listening for a while, and then walked on a little further until we heard more musicians, this time, instrumentalists warming up. Sure enough, outside a rather unassuming building, which was in fact the Oratorio degli Angeli Custodi, there were posters on display advertising a concert given by the Einstein Piano Trio. After listening to the young pianist’s warm-up we decided that this was a concert not to be missed, and we weren’t disappointed! We were met and welcomed in the small entrance area by the very talented Mattia Campetti, who spoke enthusiastically in both Italian and English and explained that he had discovered the beautiful oratory when he first sang there as a student. Most concert venues in Tuscany are quite stunning, and this is no exception. It was built in 1638 by the architect Vincenzo Paoli, and has a single nave with a barrel vault. 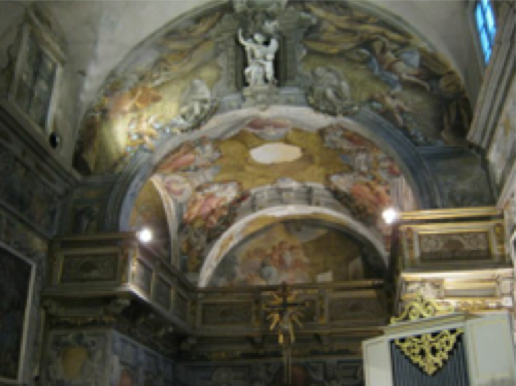 The frescos and stucco - work, including baroque paintings by such artists as Girolamo Scaglia and Pier Filippo Mannucci that line the walls, all have a theme connected to the worship of angels. The frescoes in the presbytery are by Giovanni Domenico Lombardi. In his introduction to the concert, Mattia announced that he had a surprise Baroque aperitivo for us, which would blend in well with our surroundings. He had been impressed when he heard a talented10 year old play the piano at the end of a recent piano recital, and asked him to open Saturday’s concert with a performance of Bach’s Toccata in D minor. This the assured young man did from memory and with obvious enjoyment, much to the delight of the audience. Then came the main course, the trio of violinist Erica Mazzacua, ‘cellist Alice Gabbiani and pianist Fabio Menchetti. The young Italians chose to play a youthful Brahms’ piano trio op 8, written when he was only 20 years, but as with many other of his works revised at a much later date, leaving only the Scherzo movement unaltered. It was written when he was beginning to know the Schumanns, and first completed in 1854 while he was helping them to recover from Robert Schumann’s suicide attempt. The trio is a substantial work in 4 movements; it is technically very demanding with each instrument playing an equally significant role in the unfolding drama. 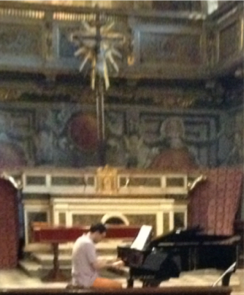 The performers were impressive in the sonority of their sound and their understanding of the composer’s intentions. The work has been described as melancholy and introspective, and certainly the final Allegro has a feeling of emotional unease and agitation, but the opening Allegro begins with a warm and lyrical melody, which moves effortlessly between the instruments, starting with the piano. Here is a clip from the beginning of the first movement. Brahms was a Romantic composer, but his studies of Baroque counterpoint and Classical structures, particularly those developed by Beethoven stayed with him and led him to juxtapose wonderful lyrical romantic melodies and harmonies within a strict musical structure. The performers managed to find that balance between youthful passion and older wisdom with the instruments often having conversations with each other or with the strings acting as one, playing whole passages in unison. The dramatic scherzo movement rollicks along at an exciting pace; definitely a descendent of Beethoven’s 5th Symphony scherzo. The contrasting Adagio has a hymn –like melody, used to form a dialogue between the piano and strings, with a more contrapuntal section sandwiched in between. The finale uses more somber material and ends in the tonic minor key of B minor with a terrific final cadence. The Einstein Trio gave a stunning performance. Here is a short clip from the opening movement where you can hear the passionate first theme in the minor mode, followed by the more lyrical second subject in the major, heard first on the ‘cello. The initiative shown in organizing concerts of such high quality, whilst at the same time providing a platform for local young talent, (amongst other things) is quite extraordinary, and I am sure that it will go from strength to strength.